Smartphones numbers are increasing day by day. But, that doesn’t take away the charisma of watches. Watches are still seen a symbol of elegance, confidence, and style. With new watches coming out every day, I have decided to give the MEGIR Water Resistant Black watch a try. The most attractive aspect of any watch is its design. Many buyers look for a better-designed watch and functionality always comes secondary. 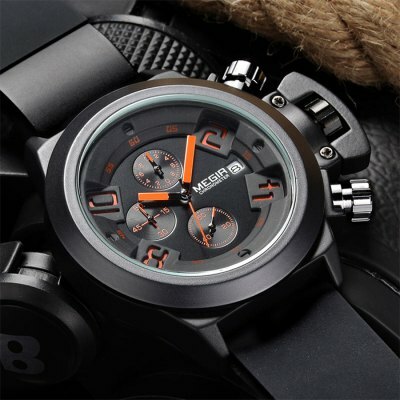 With a round dial and impressive black color, you will fall in love with the watch at the first instance. With sturdy and elegant looks, the watch is best suited for working class, but you can also use it as casual wear. Currently, the watch is available in 2 colors: Black and White. But, I received the black edition so my review will only focus on the black color. With 250mm watch length, 37mm diameter and 15mm thickness, you will find this watch fit easily in your hands. The case is made up of alloy and provides enough strength for easy handling. The clasp of the watch is Pin Buckle, which means that you have to use the pin in the leather for bucking it around your wrist. Another build quality aspect of the watch is Hardlex quality. The Hardlex is a concentrated mineral that is used in the watches. They are hard and provides a great finish to the MEGIR Black watch. With design and build done, the next thing I am going to review is Functionality. Functionality is the keystone of any watch. Many buyers want a balance between the design and the functionality, and the MEGIR watch does balance both the aspects pretty nicely. Functionally, the watch offers precision time calculation with its 1/10-second dial. It also displays data and it can work great for business professional — a single glance and you don’t have to be embarrassed in front of others. On cool feature about the watch is the Quartz movement enabled. Quartz movement is very popular among the watch enthusiast and is more accurate than the mechanical movement. With high accuracy and state of the art technology, you can use the watch with confidence. Water Proof is now the minimum requirement in watches. Getting wet in rain and shower should not damage the watch. With increased waterproof resistance, the watch can be used for adventure and other scenarios. The WaterProof rating of the watch is 3ATM, which means it can shock up some mild water conditions. It is not for swimming sessions or hot tub bath. Be extra-careful not to damage the watch. I really enjoyed reviewing the watch. It is sturdy, classy and overall a great addition in my watch collection. 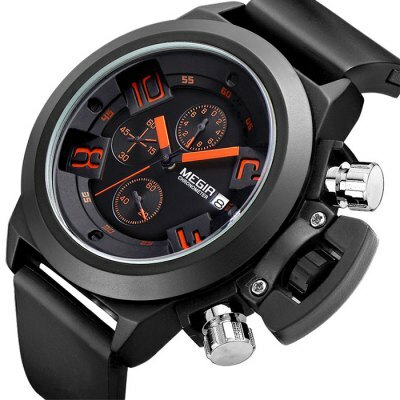 MEGIR [click here to buy] has created one of the best watches for the watch enthusiast. It’s black color is really impressive and the hardlex provides all the necessary ramp-up to the watch appeal. Loved the review? Comment below and let us know what you think about watch. Also, share it with all your friends.